I have recently been inspired to do something with plants. I got a kitten a few months ago and now, due to her, we can no longer have plants or flowers in the house because her curiosity gets away from her. So, I have been trying to think of a way to still have some kind of greenery presence in the house without harming the kitty’s health. 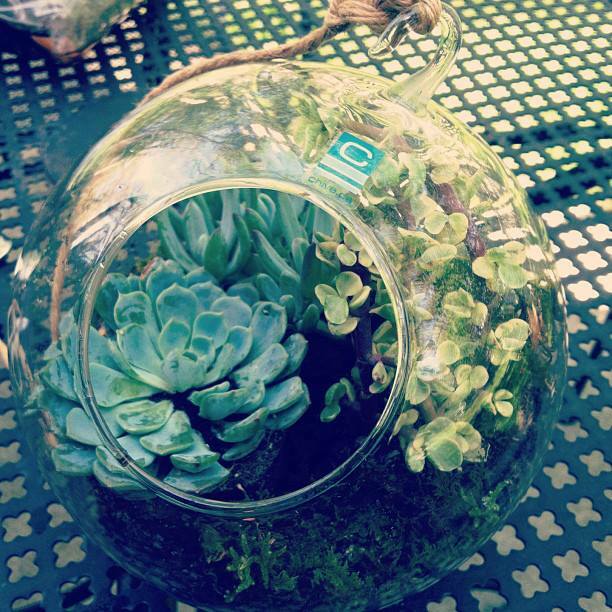 There is a fabulous garden shop here in South Bend called Marigolds where I found some cute hanging quasi-terrariums. Inspired by the owner’s creations that she had on display, I thought it would be fun to create my own. So this is what I made, and it was so fun to make, I am thinking about getting another one!